If your foodie, and I assume you have found your way to my blog because you are, St Andrews is where you need to flock to this November. A Culinary Collaboration: six leading chefs from in and around St Andrews lead this year’s St Andrews Food & Drink festival with a month-long calendar of events and activities. L-R: Alan Matthew of the Fairmont St Andrews, Geoff Smeddle of the Peat Inn, Ian MacDonald of The Links Trust, Susan Pieraccini of Rocca, Stewart Macaulay on The Adamson and Martin Hollis of the Old Course Hotel, Golf Resort & Spa. Photo credit: Alan Richardson. Prepare for the St Andrews Food & Drink Festival – a month long celebration of fabulous food & drink events, organised by six of the leading chefs in and around the town. 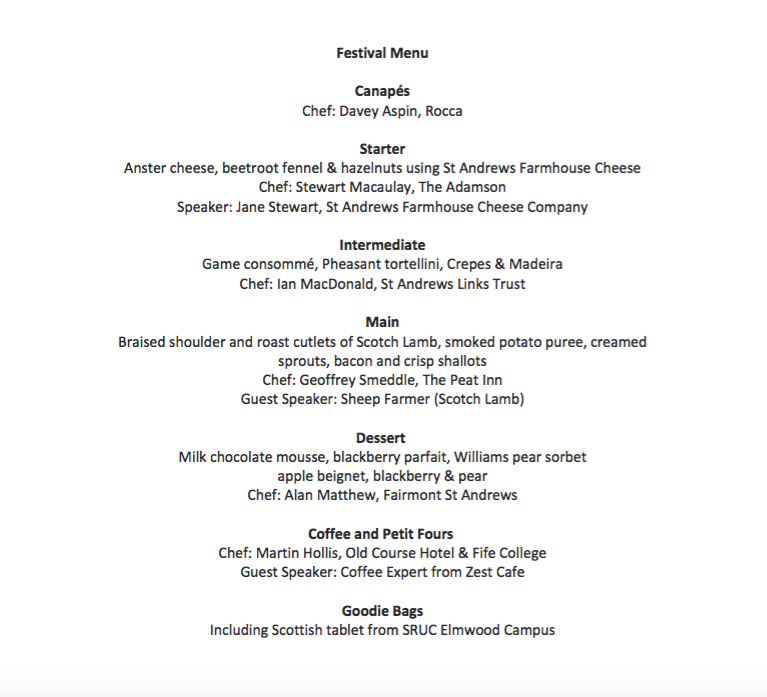 The Festival was founded in 2012 by three chefs – Martin Hollis at the Old Course Hotel, Golf Resort & Spa, Alan Matthews at The Fairmont and Ian MacDonald at the St Andrews Links Trust. This year, more Chefs have joined the festivities, including Geoffrey Smeddle from the Michelin-starred Peat Inn, Stewart Macaulay from The Adamson, winners of the 2015 CIS Restaurant of the Year, and Davey Aspin of the 3 AA rosette awarded Rocca. So, what’s the drill? Where do you need to be when? 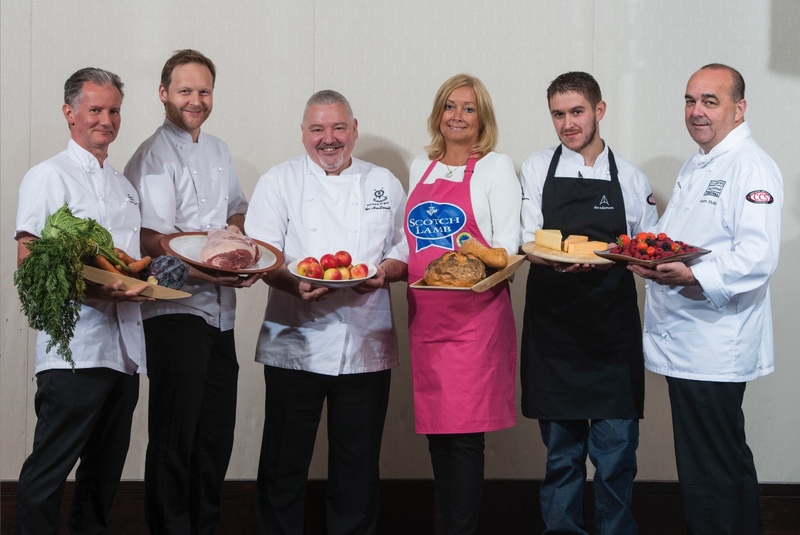 ‘Indoor Street Food Market’, 1st November, Old Course Hotel – The six chefs will each have a ‘market stall’ and visitors will enjoy tasters covering a wide range of seasonal ingredients: from East Neuk seafood to Scottish beef and lamb, local game and poultry to Fife fruits, vegetables, salads and cheese. Duncan McLachlan from the AA rosette-awarded Playfair’s Restaurant, Grant McNicol from double AA rosette-awarded Terrace Restaurant at Rufflets Country House Hotel and, from one of the region’s best advocates for sustainable fishing, Sergejs Savickis from the Seafood Restaurant will also have stalls. There will also be sorbet champagne flutes for the adults and ice cream sundaes for the children from Janetta’s, Speciality Single Origin Coffee from Zest Cafe, as well as beers and spirits from local brewers and distillers. Tickets, limited to 200, are on sale at £25.00 for adults, £7.50 for 5-12 year olds and free for under 5s. Each ticket includes a taster from each stall (children’s portions for 0-12). 11th November – An evening of Scotch beef from a celebrated family farm: Enjoy a unique dinner at the Michelin starred restaurant with rooms, The Peat Inn. Chef-proprietor Geoffrey Smeddle is joined on this special evening by Nikki Storrar of Ardross farmshop to enjoy an evening of Ardross farm’s famous beef. 25th November – An evening with award winning cheese maker, Jane Stewart: when Jane Stewart started making her own cheese from the milk produced by her husband’s dairy herds, it was an attempt to gain better value for the milk. Every Thursday throughout November, from 6pm for an hour. Tickets are £20 – and this includes 2 amazing cocktails and gives you the chance to make one. Every Tuesday throughout November. An evening masterclass learning about speciality coffee, how to look after your bean, grind and brew them to perfection. You will learn 3 different methods that are quick and easy to do at home, and will impress your guests at any dinner party! Tickets are £30 and include a delicious bag of single origin Glen Lyon coffee to take away, suitable for any level, all equipment and beans provided.